\$\beta = 100\$, Transistor Q1 is PNP and Q2 is NPN. Trying to find \$V_1, V_2, V_3, V_4\$, and \$V_5\$. I assumed active mode for both. This is more of a comment than an answer, but I don't have enough reputation to comment just yet. In this step it appears you multiplied 0.01 by 9100 rather than divide. Once this changes, everything downstream needs to change too. 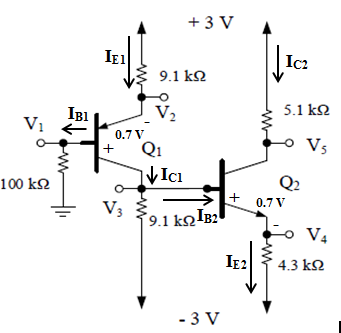 How to tell if a BJT is PNP or NPN by looking at the circuit?